Regardless of the constant financial struggle throughout the year, mom and daddy always provided a magical, White House Christmas. Maybe they robbed a bank, or made some kind of deal with Santa, I don’t know. I just know that we had a tree, stockings bursting at the seams, presents piled under the tree, and a feast fit for a king. At the time I didn’t know and appreciate the blood, sweat, and tears that went into filling our long Christmas lists. I didn’t know why mom worked three jobs, why she took in ironing, or why she hunched over the sewing machine half the night. I didn’t know why daddy worked in his cabinet shop into the wee hours of the morning. I only knew the joy of Christmas spinning its magical web around my tender, trusting heart. When we became teens however, Christmas lost its magic. Like a ruthless, winter storm, coldness swept though our house, freezing the warmth and joy that once lived there. It would be years of confusion, unanswered questions, and searching for the joy and wonder I had lost. Years of longing and waiting for the Spirit of Christmas to ignite once again in my heart. Today I am happy to say that, not only has the Spirit of Christmas finally ignited, it’s a blazing bonfire. And it’s called family. It’s called joy and happiness of being our silly, crazy, imperfect selves together. And it’s called wonderful. 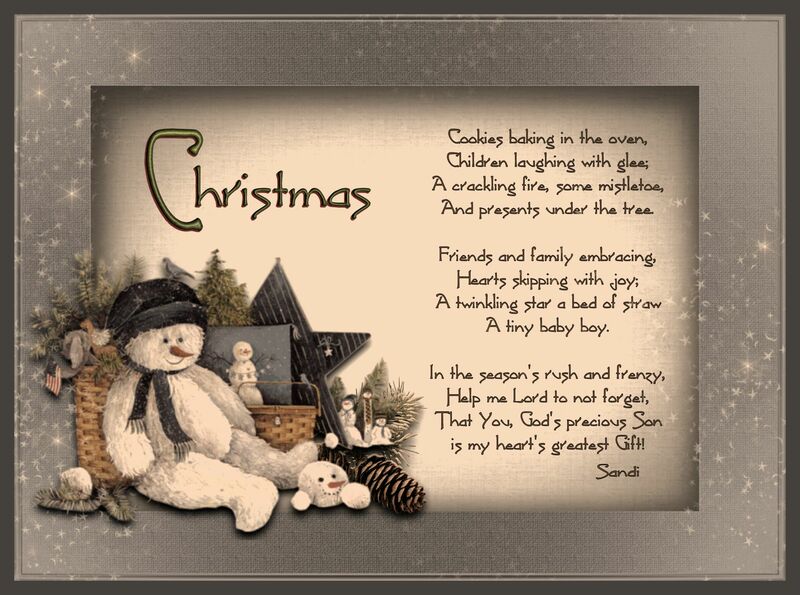 To further express what Christmas means to me, I have put together some photos taken over the years and created a few digital designs that I hope you will enjoy. There’s mom and daddy, my grandmother, and my two brothers and me. Robbie is my one and only child. Due to many complications and surgeries after childbirth, I could not have more children. But that’s okay, my son gave me four awesome grandchildren! And there’s my two oldest grand kids, Brandon and Brittany. As you can see, Brandon is the cut-up and Brittany is the charmer. There’s Brandon, the Pied Piper, leading Joshua and Jacob in a guitar game. It must be fun, I don’t know. I just know it doesn’t take much to make them happy. I’m glad God didn’t send me on a search party to find my son a wife, because he did a fantastic job finding her himself. She is perfect for him. When I grow up, I want to be just like her. And there’s Brandon and Nicci and their son, Gideon who was born August 28, 2013. Not only is this Gideon’s first Christmas, but Brandon and Nicci just moved back to Winston-Salem, North Carolina from Virginia where Brandon attended Regent University for a year and a half. We are blessed having them back home. Now we all get to spoil the baby! And there’s hubby and me. In June, 2005, my husband was diagnosed with prostate cancer and underwent surgery. He is now cancer free. In December, 2011, when this picture was taken, I had eye surgery. Then in January, 2012 I underwent colon cancer surgery. A million concerns slap you in the face at once when you think you’re going to die soon. I didn’t know whether to start making funeral arrangements or plans for a long, overdue vacation. And the thoughts of chemo ravaging my body was as scary as the cancer. I watched that monster slowly destroy my sister before she lost the battle to breast cancer. Finally, the results were in. The cancer was stage one, meaning the cancer was contained and had not effected any of the lymph nodes. Wow! No chemo on the menu; just seeing an oncologist for five years. My life wasn’t over, it was just beginning. I felt like kissing a frog on the lips! So what does Christmas mean to me? It means God, family and friends. It means celebrating life. It means a warm house, food on the table, and people to share it with. It means love, peace and harmony. It means being married to the same man for forty-three years and loving every minute of it. Yeah. That’s what Christmas means to me!